Note: This essay was originally published on The Advocates Post. Last year, on my first trip to India, I visited Raj Ghat in New Delhi. Raj Ghat (or Rajghat) is the Mahatma Gandhi Memorial and, as Gandhi has long been one of my human rights heroes, I was glad to have this opportunity to pay my respects to the man whose lessons of non-violence and human rights have had such an impact on our world. 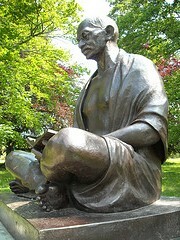 Gandhi is known of the “Father of the Nation” because of his pivotal role in India’s independence movement. But how far has Gandhi’s beloved India come in fulfilling his vision for humanity? From Raj Ghat, I went to directly a meeting with Indian human rights activists. They told us that, while important reforms have been made recently to protect the human rights of its 1.21 billion citizens, India still has a long way to go to adequately protect the rights of its religious minorities. Gandhi was cremated at Raj Ghat on the Yamuna River on January 31, 1948, the day after he was assassinated. Raj Ghat is a solemn space, a large, walled enclosure purposefully left open to the air and the white-hot sun of central India. It is set within an even larger park, with flagstone paths and shade trees – grandeur and greenery that surprised me in a city as crowded as Delhi. Yet Raj Ghat itself is true to the simple life that Gandhi himself chose. As you walk around the upper level, on a path bordered by flowers and creeping vines, you can see the square platform in the center that marks the site of Gandhi’s cremation. The black marble is so smooth that it reflects and extends the eternal flame that burns at one end of the monument, like a torch lighting the way forward in the dark of night. The red soil of his dear homeland surrounds the marble samadhi, as in life Gandhi rejected the green lawns of the English colonialists, choosing instead to leave the grounds of his residences in their natural state. To enter Raj Ghat, you must remove your shoes. This is a sign of respect, one that I honor, but I admit to never having pictured myself meeting my idol in sock feet. It was in sock feet, however, that, in the cool shade of the thick stone walls, I walked the perimeter of the memorial. On the walls of the memorial are quotes from Gandhi, inscribed in the many languages of the Indian people as well as other world languages. Raj Ghat is a contemplative place; in concert with this, visitors are encouraged to circle the memorial three times. My first time around, near the marble platform, I stopped short. Before me, inscribed in black on the red sandstone wall, were words of deep truth. 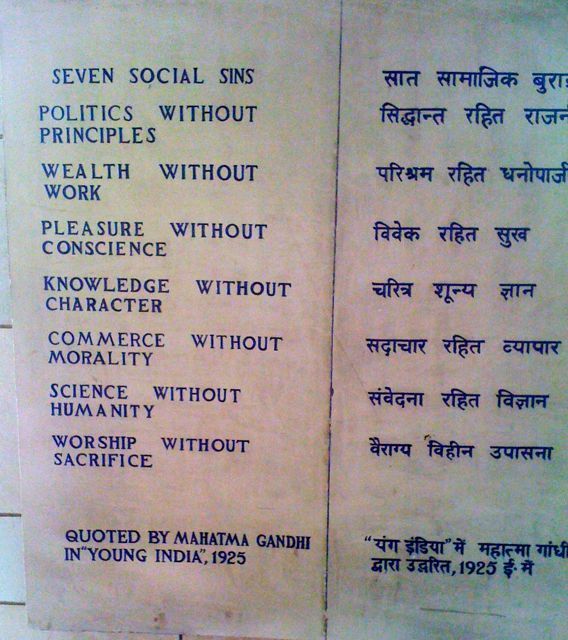 Gandhi was a prolific writer who first published his “Seven Social Sins” in 1926 in Young India, one of several newspapers he edited. Mahatma Gandhi’s words have stayed with me. Unlike the numerous foreign dignitaries who visit Raj Ghat, I did not receive a khadi scroll imprinted with the Seven Social Sins. But they are written in my heart as distinctly as they are carved on the sandstone wall of Raj Ghat. Certainly, the words were fresh in my mind later that afternoon at a meeting with Indian human rights activists. Over cups of masala tea, these human rights defenders told us about the alarming rise in discrimination and violence against religious minorities – particularly Muslims and Christians – in various states across India, including Gujarat, Orissa and Karnataka. While discrimination and violence against Muslims has long been a problem in India (including communal attacks targeting Muslims in Gujarat in 2002 that killed nearly 2000 and displaced as many as 140,000), these courageous human rights activists have documented the increasingly systematic discrimination and violence in the name of counter-terrorism since a series of bombings in 2007 and 2008. One group, Act Now for Harmony and Democracy (ANHAD), published a report in 2011 containing the testimony of scores of Indian Muslims at a People’s Tribunal on the Atrocities Committed Against Muslims in the Name of Fighting Terrorism. As they described their experiences, as well as the impunity enjoyed by security forces and non-state actors that targeted religious minorities in the name of counter-terrorism, I thought again of Gandhi. Allowing human rights abuses to be committed against a broad category of in the name of fight against terrorism is indeed practicing “Politics Without Principles”. Later in 2011, and partly as a result of what we learned at this meeting, The Advocates for Human Rights made a submission to the Human Rights Council for the 2012 Universal Periodic Review (UPR) of India. Our submission, made jointly with the Indian American Muslim Council in the US and the Jamia Teacher Solidarity Association (along with input from other Indian human rights organizations) in India, addresses India’s failure to comply with its international human rights obligations to protect members of minority groups. Major human rights challenges in India today include extrajudicial executions committed by security personnel as well as non-state actors, arbitrary and unlawful detentions, torture and cruel, inhuman and degrading treatment of terrorism suspects in police custody, and harassment of human rights defenders (including lawyers who defend Muslims accused of terrorist acts), whistleblowers and journalists. Additionally, our submission highlights the failure of the Indian government to adequately investigate and effectively prosecute perpetrators of these human rights violations against members of minority groups. The UN Special Rapporteur on freedom of religion or belief reported in 2009 that the Indian government’s failure to adequately investigate and prosecute individuals and government officials involved in human rights violations exacerbates tension between India’s political and religious groups. Discrimination against religious minorities extends to all facets of life, including access to education, employment and housing. Religious minorities also face violence and discrimination due to state level “Freedom of Religion Acts”, which fail to clearly define an “improper conversion” – a lack of clarity which gives the authorities the power to accept or reject the legitimacy of a conversion. The Human Rights Council made 169 recommendations toIndia, but the government chose not to adopt them at the June 2012 session. Instead, they government promised to respond “in due time” but no later than September 2012.